Philip Klotzbach, a meteorologist at Colorado State University specializing in hurricanes, tweeted a chart on Wednesday from the NOAA showing the strongest hurricanes to make landfall in the U.S. by the amount of sea level pressure at landfall. Hurricane Michael is listed at number three. The storm, which has been downgraded to a Category 3, is also the strongest continental U.S. hurricane to make landfall in October based on pressure and wind speed. Hurricane Michael moved in on the Florida shoreline Wednesday with raging 150 mile-per-hour (mph) winds nearing Category 5 strength, making landfall near Panama City Beach. More than 30,000 people in Tallahassee alone are without power. Florida Gov. Rick Scott warned residents Wednesday that Hurricane Michael is the “worst storm” to hit the Florida Panhandle in 100 years. The powerful storm is expected to remain a hurricane as it moves over Georgia and unleashes torrential rain and wind into the Carolinas, which are still recovering from damage sustained by Hurricane Florence. 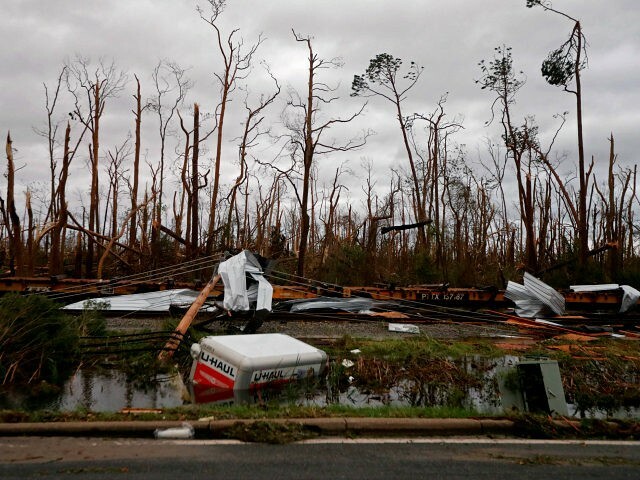 Read here for the most up-to-date Breitbart News livewire coverage of Hurricane Michael.